Mentoring is a critical aspect of graduate education, but few studies have explored the mentoring behaviors that specifically contribute to effective mentoring, making it difficult to train mentors to behave in a way that optimally supports students’ development. The Effective Mentoring of Student Researchers Scale (EMSRS) was developed to identify graduate advisors’ key mentoring behaviors. The survey instrument was distributed to graduate students at a large Midwestern university, items were finalized using exploratory factor analysis (principal axis factoring with promax rotation), and confirmatory factor analysis was conducted to confirm the factor structure. We identified four components of effective mentoring, as follows: Engaged, Positive, Professional, and Present. Implications for training new mentors and improving the mentoring of graduate students are discussed. This proceeding is published as de la Mora, A., Brandi N. Geisinger, Dan Li, D. Raj Raman, Mari Kemis. 2017. 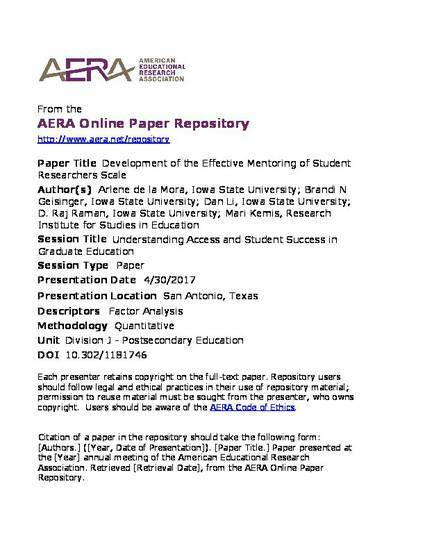 Development of the Effective Mentoring of Student Researchers Scale Paper. 2017 American Educational Research Association Annual Meeting. San Antonio, TX. April 27-May 1, 2017. DOI: 10.302/1181746. Posted with permission.